Now the nights are drawing in a great way to have fun as a family is to play board games. For this month's Board Game Club with Esdevium Games we were asked to review a game I had never heard of and on first appearances, it would not have been a game I was drawn too. Carcassonne is a tile-laying game by Klaus-Jurgen Wrede and can be played by 2 to 5 players aged 7 years and over. Every card has the same back except the start card and the cards depicting rivers. The start card should be placed in the middle of the table and the remaining tiles shuffled and placed face down in piles. Each person playing will be given 7 Meeples (of the same colour) and the remaining Meeples in your colour are placed on 0 on the scoreboard. 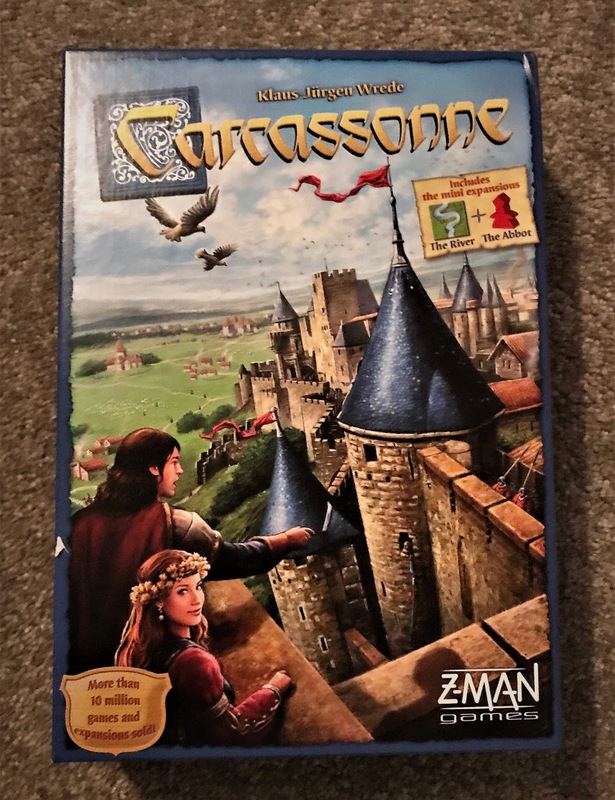 Carcassonne is played in a clockwise direction and the first player will draw a tile from the pile and place it next to the start tile so that the landscape continues. If the road continues you may place one of your Meeples on the card and it will become an Highwayman. The next person then takes their turn to continue the landscape. Meeples can also become Knights by placing them in cities and Monks by placing them in Monastery. You can only place a Meeple on the tile you have just placed. Scoring is a little complicated and below is how you score the game. a road is completed when both ends lead to a village, city, monastery or it forms a loop. Each tile in the road is worth 1 point. a city is complete when it is surrounded by walls and there is no hole inside the city. Each tile in the city is worth 2 points. If the city contains a coat of arms this is worth an extra 2 points. a monastery has to be surrounded by 8 other tiles and each tile is worth 1 point. scoring should be completed after every turn and each player with a Meeple in the scored feature earns points. the Meeples are then passed back to the right players. if one player has multiple Meeples in a feature then they receive all the points and the other players receive nothing. 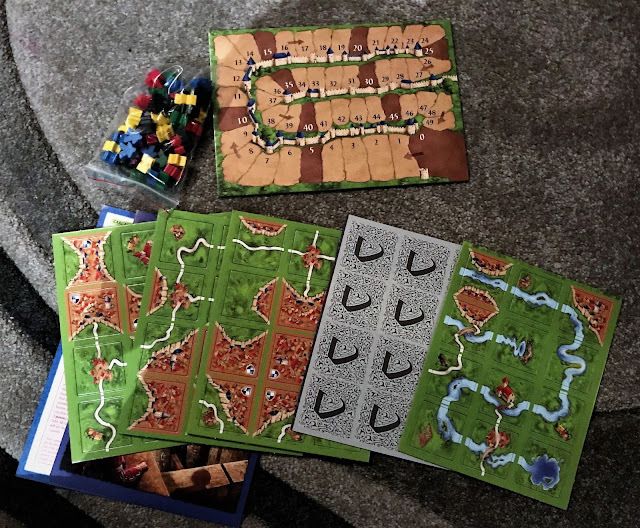 When we first started to play Carcassonne it was a little difficult to get our heads around the scoring, but the more you play, the more enjoyable and fun it is. You can actually buy expansion packs to add on to Carcassonne enabling you to build Inns, Cathedrals, Traders and Builders and these are readily available from Amazon. I love discovering new games to enjoy as a family and the great thing about Carcassonne is it doesn't take much setting up and the game play is almost instant. We cannot wait to see what arrives next month. We were sent this game by Esdevium Games for the purpose of this review but the opinion is entirely our own. Like the way you can get extension packs to keep the game going and developing. A little bit different. I love that you can buy expansion packs to keep the game growing ! Sounds interesting - we love a games night in this house! Sounds a great game, my niece is the perfect age for this and would love it! As a family, we really enjoy board games. The extension packs sound like a great way of keeping it fresh. Oh wow, sounds quite complicated but I'm sure you get the hang of it quickly as you play (always find that with board games). Great to hear about new ones - we want to do more games nights this winter!